This week’s feature was written by volunteer Sheila Chung, with additional research by the CUESA Staff. Thanksgiving may be over, but pie season is just getting going. 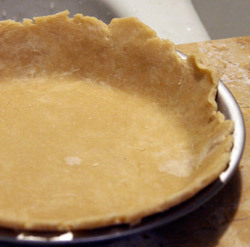 Make sure that all your crust ingredients are very cold before you start making the dough. Do not overwork the dough. Touch it as little as possible. Think good thoughts and pay attention. Dough can tell if you are anxious and will not turn out how you expect. Pay attention to how the dough looks and feels as you make it. Over time, you will develop a “feel” for the perfect consistency at each stage. Some locavores wouldn’t think to eat cherry or boysenberry pie during the winter holidays, but then they probably haven’t had a pie from Lagier Ranches yet, either. Farmer John Lagier describes his pies as “a nice home for fruit.” He’s been growing organic cherries and berries since 1997, when he diversified his family’s almond orchard. Soon, John and his daughters began baking vegan pies as a way to find “homes” for highly perishable fruit and bumper crops―perfectly ripe berries that could be frozen for use year round. John’s commitment to sustainability meant ensuring that the pies were baked with certified organic ingredients like shortening made from organic palm oil. John believes that high quality fruit sets his pies apart. When he is not incorporating his own cherries and boysenberries into the filling, he buys fruit from trusted sources like apple grower Ferrari Farms in Linden, CA. John also refrains from making his pies too sweet. “I eat pie for breakfast a lot, so I can’t have a lot of sugar,” he says. 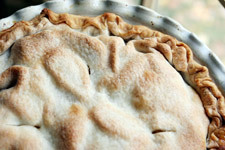 There are two factors to think about when selecting apples for pie: flavor and texture. Stan Devoto of Devoto Gardens and Karen Bates of The Apple Farm both prefer tart apples with a firm texture. Of the apples at the market right now, Stan recommends his Pink Ladies and Black Twigs, while Karen recommends her Sierra Beauties. According to Karen, Pink Pearls and Gravensteins, and early-season apples in general, have a great flavor, but they have less integrity (firmness) and can turn to mush if baked for too long. Johan Smit of Hidden Star Orchards also recommends his family’s recipe for Apple Cider Pie, which uses apple juice to intensify the fruit’s flavor. Fresh apricots and peaches are gone from the market for the season, but G.L. Alfieri Farms now carries apricot and peach pie fillings in a jar, made from their farm’s fruit, a little bit of sugar and some tapioca flour. Mince pie, though made with meat in medieval times, is now strictly vegetarian. This traditional British holiday pie is made with dried or candied fruit, nuts, and spices. June Taylor Company sells artisanal mincemeat during the holiday season. Do not make pumpkin pie from a Halloween pumpkin! Look for the smaller pie pumpkins (a popular variety is Sugar Pie). Some cooks prefer to use other winter squash varieties, such as butternut. Libby’s canned “pumpkin” is actually made from a variety called Dickenson, which looks much like (and is closely related to) a butternut. The Eatwell Farm squash pie recipe also works with sweet potatoes, and the crust, which uses their local whole wheat flour, can hold the filling of your choice.